Container terminal includes logistics activities that are needed to processing of containers considering cost, time and environmental issues. This makes terminal management problems important. These problems aim to decide the efficient planning of the terminals considering the cost and time minimization. Terminal operations include the movement of the full and empty containers between gateways of the terminals and berths by transport modes. Cranes and trucks are used in the study for the transportation. In this study, management of container processes problem has been proposed. The problem aims to perform the movement of the containers at the terminal efficiently. A simulation modelling approach has been proposed and solved by Arena software. Bichou, K. and Gray, R., 2004. A logistics and supply chain management approach to port performance measurement, Maritime Policy and Management, 31(1), 47–67. Carbone, V and De Martino, M., 2003. The changing role of ports in supply chain management: An empirical analysis, Maritime Policy and Management, 30(4), 305–20. CImpeanu, R., Devine, M.T., Brien, C. 2017. A simulation model for the management and expansion of extended port terminal operations, Transportation Research Part E: Logistics and Transportation Review 8, 105-131. Dulebenets, M.A., Golias, M.M., Mishra, S., and Heaslet, W.C. 2015. Evaluation of the floaterm concept at MCTs via simulation. Simulation Modelling Practice and Theory, Vol. 54, 19- 35. EsmER, S and Tuna, O., 2007. Liman işletmelerinde bir karar destek sistemi olarak simülasyon yönteminin analizi. D.E.Ü. Sosyal Bilimler Enstitüsü Dergisi 9(4), 120-134. Esmer, S., Ceti, İ.B., and Tuna, O., 2010. A Simulation for Optimum Terminal Truck Number in a Turkish Port Based on Lean and Green Concept. The Asian Journal of Shipping and Logistics 26(2), 277-296. Hutchins, J.L., Aicap, P.E. and Akalin, M.T., 1995. Use of Simulation Models at Container and Bulk Liquid Terminal Facilities. Ports Conference, 95, 665-676. Kim, K.H. and Park, Y.M., 2004. A crane scheduling method for port container terminals. European Journal of Operation Research, 156, 752-768. Koh, P.H., Ng, H.S., Goh, J.K. and Ng, H.C., 1994. Using Simulation to Preview Plans of Container Port Operations. Proceedings of Winter Simulation Conference,1994, 1109-1115. Ma, N.L. and Hadjiconstantinou, E., 2008. Container assignment and yard crane deployment in a contain terminal: A case study, Maritime Economics & Logistics 10, 90 -107. Ozkan, D.Ö., Nas, S., and Guler, N., 2016. Capacity Analysis of Ro-Ro Terminals by Using Simulation Modeling Method. The Asian Journal of Shipping and Logistics 32(3), 139-147. Petering, M.E.H. 2011. Decision support for yard capacity, fleet composition, truck substitutability, and scalability issues at seaport container terminals,” Transportation Research Part E: Logistics and Transportation Review, 47(1), 85–103. Ramani, K. V., 1996. An Interactive Simulation Model for the Logistic Planning of Container Operations in Seaports. Simulation, 66 (5), 29 1-300. Roh, HS, Lalwani, CS and Naim, MM., 2007. Modelling a port logistics process using the structured analysis and design technique, International Journal of Logistics: Research and Applications, 10(3), 283–302. Shabayek, A.A. and Yeung, W.W., 2002. A Simulation Model for the Kwai Chung Container Terminal: Case Study. European Journal of Operational Research. 140(1), 1-11. Tahar, R. M. and Hussain, K., 2000. “Simulation and Analysis for the Kelang Container Terminal Operations.” Logistic Information Management, 13 (1), 14-20. Vianen, T., Ottjes, J., and Lodewijks, G., 2014. Simulation-based determination of the required stockyard size for dry bulk terminals. Simulation Modelling Practice and Theory, 42, 119–128. VIS, I.F.A and HARIKA, I., 2004. Comparison of vehicle types at an automated container terminal, OR Spectrum, 26, 117-143. Zeng, Q. and Yang, Z. 2009. Integrating simulation and optimization to schedule loading operations in container terminals, Computers & Operations Research, 36, 1935-1944. ISNAD Derse, Onur , Göçmen, Elifcan . "A Simulation Modelling Approach for Analysing The Transportation of Containers in A Container Terminal System". 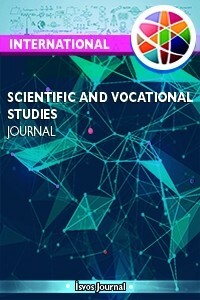 International Scientific and Vocational Studies Journal 2 / 1 (June 2018): 19-28.